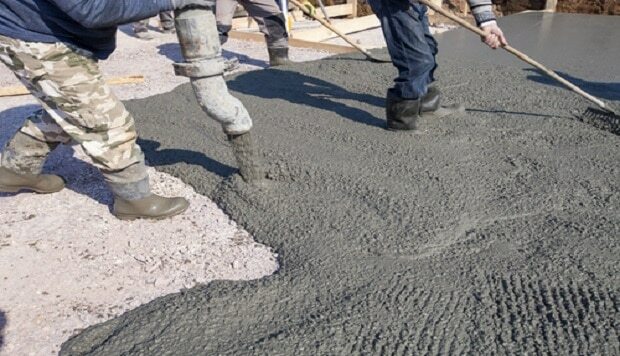 The concrete should be placed and compacted before its setting starts.The method of placing concrete should be such as to prevent segregation. It should not be dropped from a height more than one meter. In case, placing of concrete is likely to take some time it should be kept in an agitated condition. Before concrete is placed in position, formwork should thoroughly be checked for its stiffness and trueness. The surface of placing concrete should be truly prepared according to requirements and thoroughly soaked with water. The surface should be cleaned thoroughly to remove any loose matter spread over it. After having checked the formwork and necessary preparation of the surface, concrete placing is started. Following precautions should be taken while placing concrete. 1. Concrete should be laid continuously to avoid irregular and unsightly lines. 2. To avoid sticking of concrete, formwork should be oiled before concreting. 3. While placing concrete, the position of formwork and reinforcement should not get disturbed. 4. To avoid segregation, concrete should not be dropped from a height more than 1 meter. 5. Concrete should not be placed during rain. 6. The thickness of the concrete layer should not be more than 15 – 30 cm in case of RCC and 30 – 40 cm in case of mass concrete. 7. Walking on freshly laid concrete should be avoided. 8. It should be placed as near to its final position as practicable. Also Read – How To select materials for damp proof course.